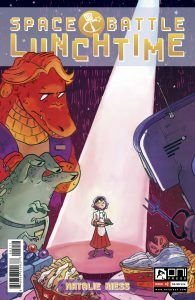 On the shelves now from Oni Press you’ll find a new full-color comic book series called Space Battle Lunchtime, written and illustrated by Natalie Riess. The idea is simple: When a famous interplanetary chef has to drop out of a famous interplanetary cooking reality show, a young woman from Earth (with dreams of being a pastry chef) is given the opportunity of a lifetime… if she can survive the experience! As with many interplanetary science fiction comics, there are boat-loads of non-human characters… and more than a few of them look rather like Earth animals you probably know! Ms. Riess is also well-known for another funny animal comic: A web series called Snarlbear. Comic Book Resources has a review of Space Battle Lunchtime that includes a lot of sample pages.